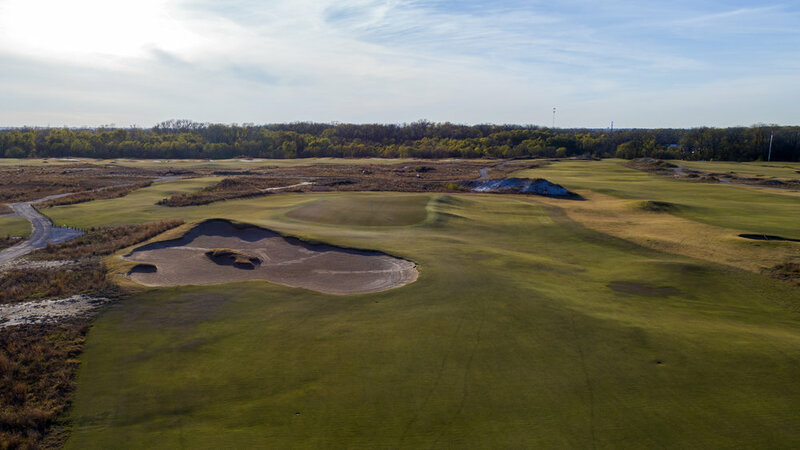 This week's AT&T Byron Nelson will feature a new venue, the Bill Coore and Ben Crenshaw-designed Trinity Forest Golf Club. It’s a rare instance where the world's greatest players will take on two of the game's greatest architects. Trinity Forest is unique to the PGA Tour and the Dallas - Fort Worth golf scene. The typically firm and fast setup tests players with short grass, contours, wind and devilish green complexes. It's a course that requires thought AND execution to conquer. A golf course where any type of player can win. It's a far cry from the typical Tour golf course, which relies on rough, water hazards and trees to defend par. This type of design is scientific and one that requires little thought. At a typical Tour stop, the line between good and bad is black and white. Trinity Forest is filled with grey. The center of the fairway isn't always ideal. Some approach shots require players to aim away from the hole to get it close. It's a course that brings the artistic nature of the sport to the forefront. The PGA Tour should be commended for selecting a golf course that contrasts the status quo. Trinity Forest is built on an old landfill that props it above the trees and creates windy conditions on a daily basis. Thanks to the landfill being an illegal dumping site for years, there is a rumpled nature to the property, which adds interest to the golf course. The landfill also limited Coore & Crenshaw's ability to dig into the ground, leading to propped up greens, many of which repel. The final product is a mix between Pinehurst #2 and an Australian sandbelt design. If the PGA Tour and Mother Nature allow the course to play firm and fast, it should yield fantastic tournament golf, a style of golf closer to the Open Championship than last week's soft PLAYERS Championship. The rumpled ground at Trinity Forest. Approach play - The firm and perched green complexes make precise iron shots a necessity. Short game - Misses around the green will run further off the green thanks to contours and short grass. It will leave tricky pitch shots to raised greens. Driving accuracy - If the course plays firm, I would expect accuracy to be more important than distance. If it's soft, the exact opposite. Par 3 play - Trinity’s par threes are exceptional and offer variety in distance and aesthetics. These holes can offer birdie looks to precise and well thought out shots. Finding the wrong part of the green leads to difficult two putts. The 3rd's strategic interest comes from a cross bunker that juts in from the left side at 280. It presents players with the question of whether to play short, left or over it off the tee. The latter is an option for only the longest players in the right wind conditions but could result in the green being driven. For most players, the question becomes angle or distance. Playing short of the bunker gives the best angle to most pin positions. Left yields a short wedge shot but a tougher angle to most flags. I would expect most to lay up. The approach to the 3rd green at Trinity Forest. The 11th has been shortened from a par 5 to a par 4 for this tournament. Off the tee, the key is threading in between the two fairway bunkers. Players will be wise to think about their angles on their approach to the green. This half of the double green features a false front before running from front to back. Flags on the right and left side have bowl-like features around them, so if attacking from the proper angle, they can be used as an advantage. The fifth will become one of the best short par 4s on the PGA Tour. Off the tee, it appears that the only hazard is the large bunker that rests about 30 yards short of the green, but that's not the case. Without an obvious hazard around the green, it makes it almost impossible for a world-class player to resist going for it. That plays right into Coore & Crenshaw's hands as the 5th shows how vexing simple contouring can be. Any miss long or left of the 5th can spell disaster. The miniscule and perched green repels balls to all sides and slopes severely from back to front and left to right. It will be a week where we see numerous balls roll back to players’ feet and potential up-up-and-down par saves. Those who don't want to risk death by contours can lay up easily with a 6-iron and have a wedge shot. With windy conditions and the green slope, it’s hardly a gimme. The 6th has one of the most interesting greens in golf and some great centerline bunkering that dictates strategy. Check out our full writeup on the 6th here. The brute 13th will be a tough par from the 480-yard back tee. Off the tee, a wide fairway slowly narrows along the right side starting at 250 yards from the tee. The left side of the fairway yields a better angle to approach the green, but it also slopes away towards the property line. It's a classic Coore & Crenshaw hole that mirrors the 18th at Sand Hills and the 15th at Streamsong Red; challenge the trouble (left) with a driver and reap the reward of an ideal approach. Every yard off the left line yields a worse angle to attack due to the long and narrow greens pitch. In all walks of life, the typical reaction to something different is negative. Trinity Forest will offer a different test this week. It will be a departure from the monotonous one-dimensional test of execution we see on Tour most weeks. Instead, we will see a modern counterpart for today’s professional, a course designed by two of today’s most prolific architects that will test players’ ability to think and execute shots under pressure.